Back in the Fifties and Sixties people were optimistically designing machines 'who' could learn and behave with 'intelligence'. The technology of the time was pre-semiconductor, and implemented electro-mechanically. We were all very excited and thought intelligent machines, like cheap atom power and flying cars, was just round the corner. The weighting was done by motor-driven potentiometers, which held the weight value even if switched off. Learning involved adjusting the weights until the perceptron had learned the desired function. Unfortunately, it was soon proved that perceptrons would never be able to create certain selected output functions. Specifically, they could learn logic gating like AND or OR, but not XOR! Software has to model two phases. In the learning phase, the various binary input possibilities are presented, and the output with the present weights is compared with the desired output. Specifically, we sum the product of input values times weight of that path/input, and see if the sum exceeds the threshold. The weights are immediately corrected by an amount depending on their present value, the corresponding input, and a fixed 'learning rate'. 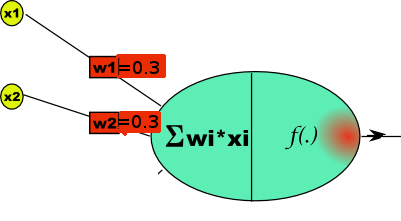 The set of inputs is repeatedly presented until the weights converge on values which predict correctly. In the operation phasenew inputs are presented and the circuit/code gives the correct output. In some languages, eg Python, there are neat ways to represent variable-length lists/vectors, and do things like dot-product ( sum the product of each term in one list ( representing the inputs) multiplied by the corresponding one in another list ( representing the corresponding weights). In LB you can do this kind of operation with arrays, but for a general implementation it's a pain deciding what dimension to give the arrays and not waste space. I instead used the 'word$(' operator to concatenate lists. weights$ = "0.0,0.0,0.0" represents a list of three weights, each initialized to 0.0.
trainingSet$ = "1,0,0,;0 1,0,1,;0 1,1,0,;0 1,1,1,;1" represents a list of lists. Its first term, '1,0,0,;0', represents three inputs, '1,0,0' and the desired output, '0'. I implement a perceptron as described in Wikipedia. You can choose 2 or more inputs. It is given a set list of examples to repeatedly use, and once trained demonstrates its learned outputs.
' Rem/Unrem any one of the following, which all work.
' NB  the failure to be able to learn XOR led to the decades of 'AI Famine'.
' then it was realised multi-layer perceptrons CAN learn this and other symmetric examples. nInputs         = count( case1$, ","):              print " Number of input signal paths- ",,                   nInputs: print ""
if i <> nInputs then weights$ = weights$ +","
print " Test whether it works, after learning from examples." 'data "0,0,0", "0,0,1", "0,1,0", "0,1,1", "1,0,0", "1,0,1", "1,1,0", "1,1,1"
data "1,1,1", "1,1,0", "1,0,1", "1,0,0", "0,1,1", "0,1,0", "0,0,1", "0,0,0"
Test whether it works, after learning from examples.